Pacific northwest trees are one of the most important resources to survival. They provide firewood, shelter, tools, food, medicine, wildlife habitat, and so much more to the ecosystem. If you know how to identify and use the trees in your local forest it will enhance your feelings of self-reliance and confidence in the outdoors. They are a great resource! In this article I will share a few of the most common deciduous trees we see in the forests of western Washington and some of their survival, edible and medicinal uses. If you are interested in the common evergreen trees of Washington check out this great article: https://www.wildernesscollege.com/types-of-evergreen-trees.html . This common maple is one of the most easily identified Pacific northwest trees by its opposite branching, maple-like leaves, and green bark. It is our most common “durable” wood that is strong in tension so it is ideal for a wide variety of rugged projects. 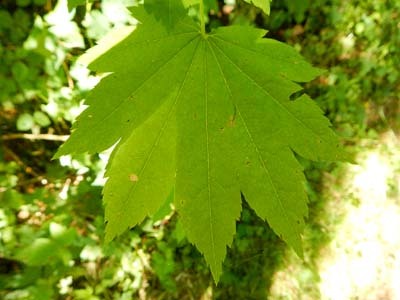 At Alderleaf we use vine maple for bows, fish spears, trap parts, shelter construction and more. Native Americans used vine maple for bows, tool handles, love medicine, baskets, snow-shoes, house building, baby cradles, fish traps, acorn paddles, small boxes, oil containers, bowls, drinking containers, and salmon tongs. They also ate the sap and mixed the charcoal of vine maple with oil and used it as a black paint. If you want to learn more specifics about these Native American uses of Pacific northwest trees such as how to make a love potion, you will have to do some research… but it sure is interesting! Generally, deciduous Pacific northwest trees that grow near water are great woods for friction fires. Black cottonwood is one of the best, especially the roots. If you find an overturned cottonwood and the roots are exposed, be sure to collect a few nice straight pieces for fireboards and spindles. Conveniently, the dry inner bark of cottonwood makes fantastic tinder. Black bears love to scrape off and eat fresh cottonwood bark in the spring so keep an eye out for their sign! Cottonwood is brittle so it is not great for durable tools but it does have some very important medicinal qualities. A salve from the buds is a great pain reliever for arthritic joints, injuries, and tendinitis. The buds hold the most potent medicine and a tincture of them makes a great expectorant for congested chest colds. 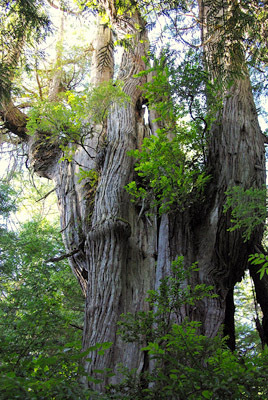 You can make a salve from any part of these Pacific northwest trees – buds, leaves, or bark. It is great as a wound salve - reducing inflammation, encouraging healing, eradicating bacteria and tightening surrounding tissue. Alder is one of the most common deciduous Pacific northwest trees. 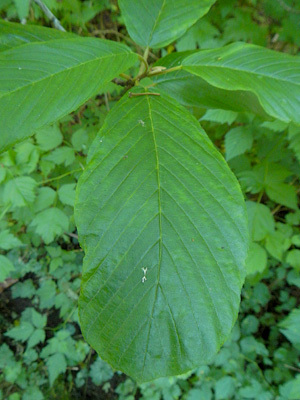 It has smooth bark and serrated leaves. It is a “pioneer” species which means it is one of the first to colonize a site that has been cleared or disturbed. This is one of the reasons we chose Alder for the name of Alderleaf Wilderness College! We strive to be a pioneer school that can help people become better stewards of the earth. Alder is a member of the birch family which means it ROTS. It amazes me how fast birches decompose after they die. This benefits an ecosystem in a variety of ways. Unfortunately this also means Alder is a poor wood for tools or shelter building. It is however a decent friction fire wood and it is great for burning in campfires. Because of its abundance, we often cut live Alder and use it for quick survival purposes. 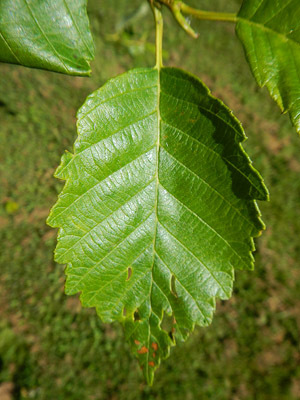 Native Americans used Red Alder for many things. They took a decoction of the bark as a purgative, applied the sap to cuts, chewed staminate aments for sores, rubbed the rotten wood on the body to ease “aching bones”, chewed the catkins for diarrhea, ate the fresh cambium with oil in the spring, used the wood to smoke fish and meat, boiled the bark and used it as a red dye, used the wood for carved dishes and canoe bailers, used the roots to make baskets, masks and rattles, canoe paddles, and they used the bark to line pots for storing elderberries! Cascara is a little less common than these other trees but we still encounter it quite frequently. 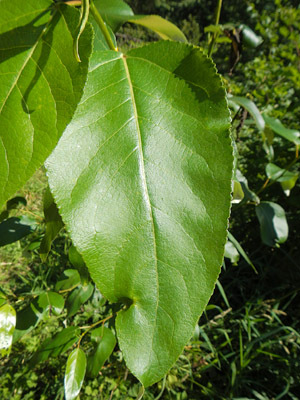 It can be identified by its smooth waxy leaves, smooth bark and long curved twigs. It is commonly known as a strong laxative although I have never attempted to use it for this purpose. The berries are considered poisonous but bears love to eat them. Native Americans were well aware of the medicinal properties in Cascara. An infusion of bark was taken as a strong laxative, a poultice of the bark was used for wounds, the fruit was considered poisonous, bark was chewed by children with worms, an infusion of the foliage, twigs and bark was taken as an emetic (to cause vomiting), the bark was mixed with crab apple bark to prevent the crab apple from constipating the user, an infusion of the spring bark was used as a disinfectant for cuts, wounds and sores, an infusion of the bark was taken for gonorrhea, and the wood was used to make implement handles – especially D-adze handles. 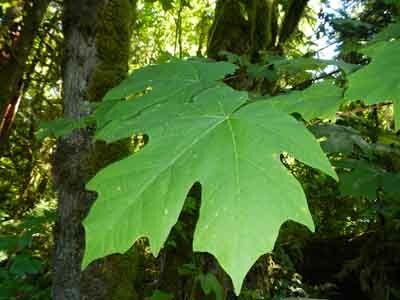 Bigleaf maple is one of our most common deciduous Pacific northwest trees in the forests of western Washington. They grow very large and are often covered in moss – a beautiful sight to see and a classic image of Washington. They have classic maple-like leaves, only bigger! Bigleaf maple is a great friction fire wood. The straight shoots can be used for hand drill when dry and seasoned. Try them on a douglas fir fireboard. The shoots also make great arrows. Native Americans used this tree for many things. An infusion of bark was taken for tuberculosis, sticky bud gum and oil was used as a hair tonic, sap was eaten dried and fresh, seeds were used for food, leaves were used in steaming pits to flavor meat, cambium was eaten in small quantities with oil, sap was boiled to make syrup, raw shoots were used for food, wood was used for house construction, it was considered good firewood, wood was used for canoe paddles, inner bark was used in spring for baskets, bark was used to make crude dresses, bark was used for rope and tumplines, and the leaves were made into mats and used to cover the layers of dried salmon that were stored in baskets for the winter. I hope that was a helpful introduction to some of our most common deciduous trees. If you are interested in any of the Native American uses that I mentioned here please follow up with the sources I listed and do further research to find out more specifics on how they prepared the medicines and food. Good luck! Knowing how to identify trees and knowing their uses is one of the most important survival skills we teach in our Wilderness Certification Program. For me, I don’t really know a plant until I’ve used it for something. That is why I love woodworking and survival skills. It connects me to the Pacific northwest trees because I get to know the different quirks of each species. 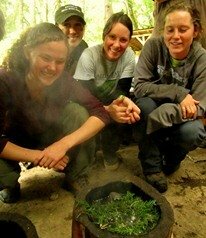 If you are interested in learning more about the forest and these survival skills check out our course calendar. About the Author: Connor O'Malley is an experienced wilderness skills educator. He taught at Alderleaf for several years. Learn more about Connor O'Malley.